Migration and immigration fuels one of the biggest debates in British society. It’s in our newspapers, on our television screens and has now made its way to the British stage. A double bill, ‘For One Night Only’ by Oladipo Agboulaje, and ‘Letting Go’ by Rukhsana Ahmad, they both tell the stories of migrants who risk their lives by any means possible to get to the shores of England, seeking greener pastures. Their hopes and dreams all depend on one voyage. However, they soon find that their past still calls at them either by way of the sea through which they came or their family back home, who expects them to work financial wonders and miracles once they get to England. In ‘Letting Go’, Ahmad tells the story of Abbas, who is continuously being tormented by memories of his brother who dies as they crossed the English Channel to get to Britain. Despite being able to escape the war that has ravaged his home country, the war within him won’t stop due his loss. Everyday, he sits at Dover and watches as the ships come in, anticipating that his brother might be on one of these ships. Only to realise in order to move on with his life, he must first let go of the hope that his brother is still alive or forever remain trapped. 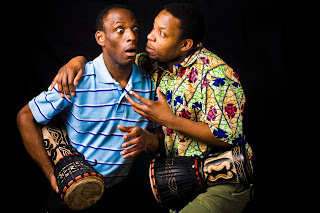 Agboulaje tells a different story in ‘For One Night Only,’ Eddie and Bode have come to England to pursue a better life and that dream is to one day perform at Covent Garden.. They are economic migrants in search of the good life and will do whatever it takes to please their families who expect nothing less than success from them. However, the road to Covent Garden is not a straight forward one. Within the cosy confines of the Oval theatre, Helena Bell brings this story to life. Using minimal stage props, she forces you to focus on the characters and their stories. Immigration is a subject that divides people with varying opinions but you are forced to feel empathy for these characters who reflect the stories of others you have heard of. Stories about survival, quest for freedom and above all, their struggle for a better life individuals from all corners of the world embark on, when they set out on a voyage when they leave the world they have always know for one where they are all alone with no help from anyone. Agboulaje and Ahmad have created a powerful lense, a diasporic narrative, through which one can take a different point of view to the issues of immigration in Britain today. While the subject is timely, topical and thought-provoking, Footprints in The Sand, could have done with more energy and allow a sense of depth about its theme to permeate long enough. So, you don’t feel disconnected once you leave the theatre, thinking it's just another story. 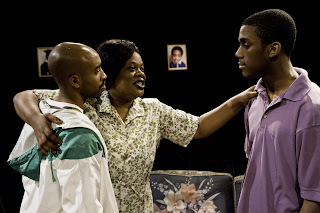 My mother’s motto has always been and still is, ‘if you live under my roof, I clothe and feed you, and pay the rent, you must live by my rules.’ Levi David Addai has successfully captured what has long been the tradition of British-African parents on the London stage in his new play, House of Agnes. 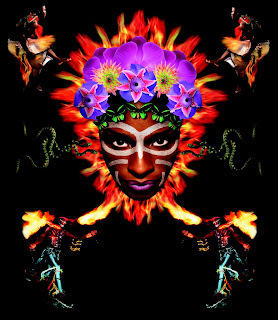 An exploration of the British-African way of life, Addai brings to life, the challenges of a single mother from two conflicting cultural perspective. Agnes has lived and worked in England for the last 40 years but has decided its time to go back home to Ghana. However, she must get her sons, Solomon and Caleb to agree on living together in peace and do as she wants. This sets them on a course of collision because these are two young men with a mind of their own and want to be free of Agnes’s control. 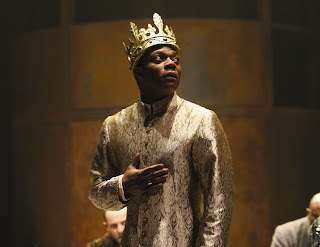 Solomon wants to make his own decisions and at the same time, wants his mother to accept his girlfriend, Davina, who Agnes dislikes and refers to as ‘Jezebel.’ Needless to say, her resentment is unfounded. Caleb appears to have his life in order in comparison to Solomon, whom he considers to be ‘reckless.’ While he is happy to please his mother, he also wants to be free of her control. Their differences set them on a path of sibling rivalry. Though they want to be able to lead their lives on their terms; they also crave their mother’s acceptance and to a certain degree, approval. Cecilia Noble delivers a brilliant performance as Agnes the Matriarch who worries more about her precious white carpet than the feelings of her sons. Nevertheless, she is not afraid to lay down the rules or let people know that she is from the ‘old school.’ Ludvig Bonin and Anwar Lynch shine as two young men who can rise up to the task and bring intense moments alive on stage. House of Agnes is a clever, tender and accomplished examination of clashing traditional and cultural values one family has to face up to, which is reflective of the wider society. 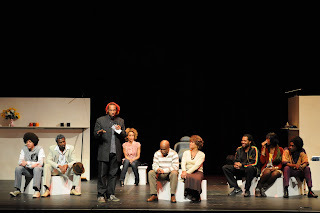 Addai shows family tension through of his characters and you are able to relate to each one as their make their case. A testament to Addai’s understanding of traditions, cultures and the gap that exits between generations. Topical and timely, Testing The Echo is the long awaited response from British theatre to help define Britishness. Is it true that ‘being able to see the other point of view is what being British is about?’ Better still, why do people decide to become British citizens? Mahmood is a young Pakistani migrant who wants British citizenship so his father will be pleased with him. Tetyana wants to escape an abusive marriage and Chong wants to be able to travel, so he can see his family again. They all have their different reasons for wanting the red passport but are they willing to live by the values of the country they crave to be part of? 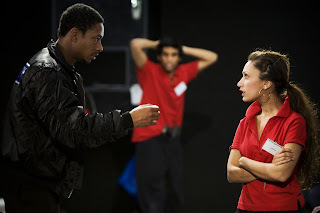 This soon becomes the focus of the play as Emma (Teresa Banham), an ESOL (English For Other Speakers of Other languages) teacher, is embroiled in a classroom confrontation with Nasim. Who feels she is being made to learn things which are in direct contradiction of her Islamic beliefs when the class is made to learn about what constitutes an English breakfast and the notion of learning all about pork doesn’t go down too well with her. Going through an ESOL class is one thing but taking the citizenship test and crossing the final hurdle of swearing allegiance to the Queen brings up an entirely different set of questions. A number of issues jump at you; national identity, a sense of place and belonging, and without a shadow of doubt, the differences between British values and other cultural values. The values of migrants from different parts of the world who have made Britain home but hold on to their traditional and cultural beliefs. We are confronted with the challenges of multiculturalism. How accepting are we of each other and where do we draw the line when it comes to the things we hold on to sacredly, especially our religious beliefs? Written by David Edgar and directed by Matthew Dunster, Testing The Echo is intelligently written and thought-provoking. For its ability to capture the mood of differences which exists in a fragmented society hides itself under the disguise of multiculturalism, it is certainly a brilliant production. It certainly speaks volumes about the state of our communities and society and is tied together by the thread of identity which transcends the boundaries of race alone. When you get an actress who lives and breathes the words of her character on stage and exteriorises every action, you are onto something. Within the intimate confines of the Pit, at the Barbican, Yael Farber has taken the ancient Oresteia Trilogy and given a modern day South African twist with the core message of truth and reconciliation. Elektra watches on as her mother takes the life of her beloved father. She is soon resigned to the role of a slave in her father’s home, a place that is rightly her inheritance. Subjected to inhumane torture at the hands of the woman she calls mother. She also awaits the return of her brother Orestes, whom she hid years back, so her mother would not murder him like she did their father. The stage action is gruesome as Klytemnestra inflicts the pain of cigarette burns, drowning and the use of the wet-bag - a form of torture used during the apartheid era in South Africa and made famous during the Truth and Reconciliation Commission hearings - to suffocate her. I have often heard of people who are suffocated and how they struggle and gasp for breath. However, seeing it live on stage as Elektra struggles with her arms and legs flapping, I suddenly feel the pain of the countless victims who have died gasping for air. Heartless does not describe what the first half of this play holds in store for us, the audience. 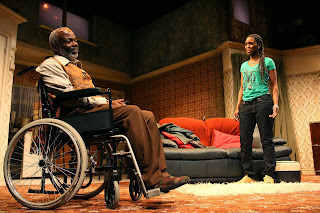 However the road to reconciliation is even harder for the characters we see on stage as they face up to the reality of life and the fate it has dealt them. 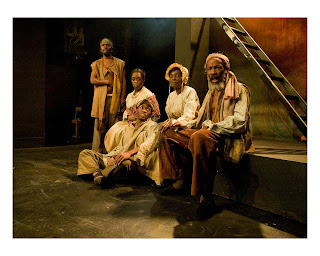 Every action on stage is reminiscent of South Africa’s struggle to reconcile its years of atrocities as it forges ahead to be become the Rainbow nation. Elektra’s hunger for vengeance consumes her to the point where she poses the question, ‘If you rob us, shall we not revenge?’ to the audience. However, Farber is questioning the whole literal notion of an eye for an eye. The performances are brilliant as is the writing and direction. 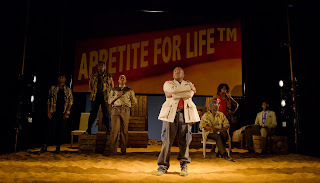 Jabulile Tshabalala is formidable as Elektra and takes responsibility for her character throughout the play. At no point did she lose the momentum of the emotions created on stage. 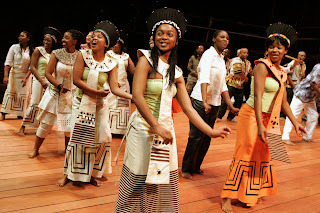 Dorothy Ann Gould is enigmatic as Klytemnestra and the chorus of Xhosa tribeswomen add a hunting and evocative traditional meaning to the production. At the heart of Farber’s interpretation is our ability to forgive when the deeds against us are unforgivable. When do you get to that point where revenge is no longer what drives you but a will to live. Farber has once again gone to the deep reserve of her resources as a writer and director to show what the human mind is capable of. She is also keen to let you know that revenge is consuming and the ability to move on begins to manifest when you let go of your past in order to regain your future.